So He closed Vic's weary eyes and whispered "Peace be thine." For part of us went with Vic the day God called him Home. 4 AUGUST 1999: It's been a time of such incredible loss and sadness. 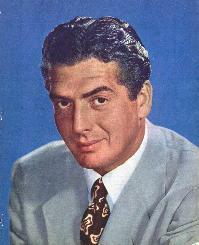 Victor passed away on August 4, 1999, at his home in Rancho Santa Fe after a three-year battle with cancer. Victor was one of the true gentlemen of Hollywood and was a very respected man who always was there to help a friend and had a gentle heart. He was the epitome of the perfect man with charm, humor and kindness. He was a very talented actor who gave us so many wonderful films. He will be missed more than words can say. Our deepest sympathy goes to the entire Mature family on the loss of their beloved Victor. The Mature's Matinee Fan Club will continue as a tribute to Victor, his wonderful career, and to the amazing person he was.